While it is true that Florida contains many fun attractions such as great theme parks, interesting zoos and a plethora of great shopping, one should really pay attention to the finer parts of the state such as Destin Florida. Destin Florida is a beautiful beach haven filled with gorgeous white sand and breathtaking clear waters. While Florida is home to many great beaches, Destin is the place that gives you that extra something and takes your vacation to a whole other level. Here you can find the ultimate in relaxation and find true peace of mind. Destin Florida is an ideal place to vacation for families on vacations, couples on a romantic getaway, or those who are seeking a bit of time away alone. Besides spending time on the gorgeous beaches of Destin Florida you can take part in other fun activities such as water sports. Destin is famous for snorkeling, parasailing and just about any other activity you can do in the water, including fishing. If you are a fishing enthusiast you will marvel at all the fishing opportunities you will find here. Small cruises are also popular here. After your day at the beach you can head out to one of Destin's delicious restaurants. You will find many different varieties of eateries available to choose from. Whether you want a romantic elegant dinner, to a fun family affair, you will be able to find it here in this charming town! You could also stop by one of the local clubs or take the family to The Track Recreation Center for fun. 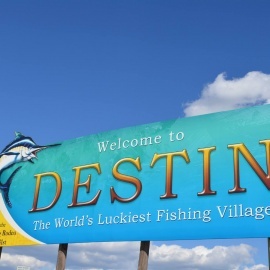 As most will agree, Destin Florida is one of those one of a kind places that has something to offer everyone!